Found myself at Levi's Plaza today with an hour to kill. The result? The best freaking Dungeness crab cioppino I've had to date in San Francisco, thanks to the kind folks at the Fog City Diner. Why hadn't I dined at this San Francisco classic before now? JEEZ! 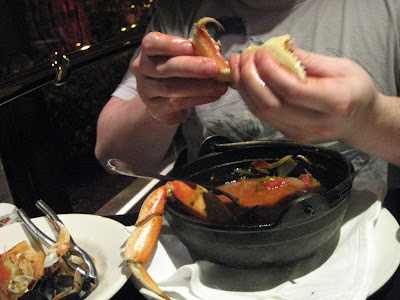 The crab was so sweet and fresh, it had a near-floral quality. I was kindof dying. The cioppino broth was perfectly savory, chocked with fennel bulb, tomato, peppers, onions, and plenty of fish, clams, mussels, and shrimp. Maitre d' Randy Simmons rules, by the way.